We are proud to announce our brand new menu of services with our new laser machine! We will be offering the ever-popular, laser hair removal, LimeLight Laser treatments and Laser Genesis Skin Therapy! Not sure if a laser treatment is for you, read more about these services below and give us a call for your complementary consultation! The Limelight laser targets pigmentation, skin redness, facial telangiectasias (small veins), rosacea, and sun damage on any part of your face, neck or décolletage (exposed chest). We customize your Limelight facial treatment to your skin type and selectively treat the brown and/or red-pigmented areas on your skin. There is a pulse of light delivered onto the skin which patients report feels like a mild pinching or stinging sensation. A unique feature with our laser machine is the ability to add a cooling effect during treatment, which helps reduce discomfort and immediately soothe the treatment area. Anesthesia or pain medicine is typically not required. Treatment time depends on the area of the body being treated. However, most treatments should take less than one hour. How many treatments will I need? One to three treatments are usually sufficient to see results. Additional treatments may be recommended, especially for excessively sun-damaged skin. Immediately following treatment, your brown spots will start to darken and your skin may appear slightly red. The treated area may be mildly swollen. This typically lasts a few hours to a couple of days. Makeup can be applied to cover the redness. Within one to three weeks, the darkened spots will flake off and fade. Diffuse redness or tiny veins will decrease and your mottled complexion will improve. Laser Genesis is a resurfacing treatment for wrinkles, large pores, skin texture, diffuse redness, rosacea, poikiloderma (skin aging with pigmentation) and scars on the face or other body parts for both men & women. Laser Genesis helps restore the skin’s youthful glow and appearance. You will see a healthier complexion as large pores are reduced in size, and minor imperfections are diminished. The individual treatment results are subtle, but the overall effect of multiple treatments can be quite dramatic. By gently heating the upper dermis well below your skin’s surface, Laser Genesis stimulates collagen regrowth. On average, you may require four to six treatments in order to achieve optimal results. You will experience a gentle warming of your skin’s surface as the laser hand piece is moved back and forth about one-half inch above your skin. You can immediately return to normal activities, using sunscreen if participating in outdoor activities. Clients often refer to this treatment as a “hot stone massage” for your face. Laser hair removal is non-invasive light therapy designed to safely eliminate unwanted hair from all parts of the body. The laser generates a pulse of intense, concentrated light directed through a small, cooled hand piece that is gently applied to the treatment skin. Each pulse of the laser lasts only a fraction of a second and treats an area just under a square centimeter. The laser energy passes through the skin to the hair follicle where it is absorbed by pigment in the hair and hair follicle. The absorbed light energy is converted to heat, which damages or destroys the hair root but not the surrounding skin structures. Call for pricing and packages. 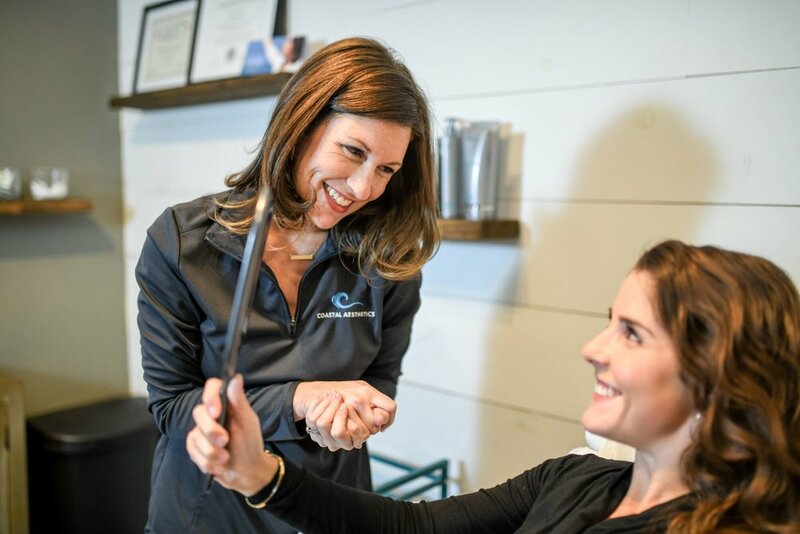 Complimentary consult is required before first treatment to assess skin and hair tone; this ensures the correct strength and tool are used for your individualized treatment. For consult only, please come in with a small amount of hair growth so quality and texture of hair can be determined.